Summary from Goodreads: San Francisco, 1906: Fifteen-year-old Mercy Wong is determined to break from the poverty in Chinatown, and an education at St. Clare’s School for Girls is her best hope. Although St. Clare’s is off-limits to all but the wealthiest white girls, Mercy gains admittance through a mix of cunning and a little bribery, only to discover that getting in was the easiest part. Not to be undone by a bunch of spoiled heiresses, Mercy stands strong—until disaster strikes. 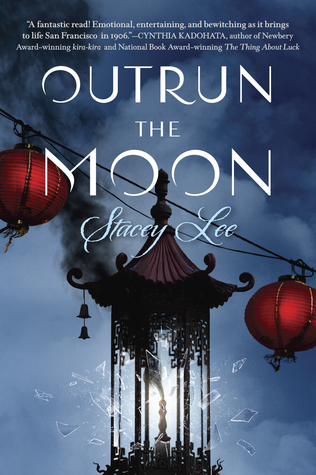 Outrun the Moon by Stacey Lee was an amazing story about the great 1906 San Francisco Earthquake. I absolutely loved this book. The writing was beautiful and I loved our main character, Mercy Wong. And just the whole story in general. Mercy Wong was such an awesome character. I loved reading from her point of view. Mercy is a Chinese girl living in San Francisco Chinatown in 1906. She’s determined to get a better education because the school in Chinatown ends at sixth grade. So basically, Mercy blackmails her way into getting into St. Clare’s School for Girls, a prestigious, wealthy boarding school. But part of the deal was that she had to pretend to be an heiress from China, which she is not. I absolutely loved Mercy’s personality. She was so stubborn and fierce and determined, but at the same time, she was very kind and loving. The way she always looked out for her little brother was just so sweet. However, playing the part of a Chinese heiress at St. Clare’s is a lot harder than she thought. While some of the girls are welcoming and quickly befriend Mercy, some do not, and will pretty much do whatever they can to get her out of the school. And mainly because of her race. This book addressed sexism and racism in the early 1900s a lot. It talked a lot about how the Chinese were treated. I mean, the whole book isn’t about it, but it’s definitely touched upon. Mercy is Chinese, so she witnesses and is a part of a lot of racism. As Mercy is faced with struggles at St. Clare’s and at home, an earthquake hits San Francisco. And not just any normal, harmless earthquake, but a terrible, crazy one. The Great Earthquake of San Francisco actually led to the deaths of over 3,000 people and almost all of San Francisco was destroyed, and on top of that, there were a lot of fires afterwards. So yeah, it was a pretty big deal. I knew the basics of the earthquake, but I learned SO much about it by reading this book. Okay it was historical fiction, so some of the details were fictional. But I still learned a lot about the earthquake. I found that part of the book super interesting. I mean, you all know that I am historical fiction obsessed and I love history, so I’m always looking to learn more about history. There was hardly any romance in this book and I loved it. Honestly it’s kind of tiring how just about every YA book is all about romance, so this was very refreshing. There is a love interest, and though Mercy thinks about him a lot, he isn’t actually in the book very much. Like we don’t seem them together often. I’m really glad Lee didn’t make romance the focal point of this novel and instead focused on Mercy’s story and how she got into St. Clare’s and what she did when the earthquake hit. Oh and I just loved the friendships. Mercy makes some incredible friends in this book, and I loved all the side characters. The earthquake really brought the girls closer together and by the end of the book, they were all such great friends and they were rooting for each other and it just made me so happy. I love strong friendships in books, so that aspect of the book definitely did not disappoint. The writing was beautiful. I fell in love with Lee’s writing style in Outrun the Moon, and it’s got me impatiently waiting to get my hands on her other books. Parts of this book were hilarious and got me laughing out loud with Mercy’s crazy thoughts and the dialogue, but others made me really feel for the characters. I love when authors are able to do that. Not only can they make you laugh or cry, or both, but they really make you feel for the characters and you’re able to connect with them emotionally. I gave it four stars just because it was hard for me to get into at first. Once I reached around 75ish pages I started really getting into it, but at first I was having a hard time. There were parts where it seemed to drag on a bit, but for the most part it was a wonderful book and I loved it.It just didn’t really blow my mind like a five star book would. It was still such an incredible, amazing story, but it didn’t feel like one of those books that leave you knowing it was five stars. Does that even make sense? Overall, Outrun the Moon was a wonderful, diverse story. 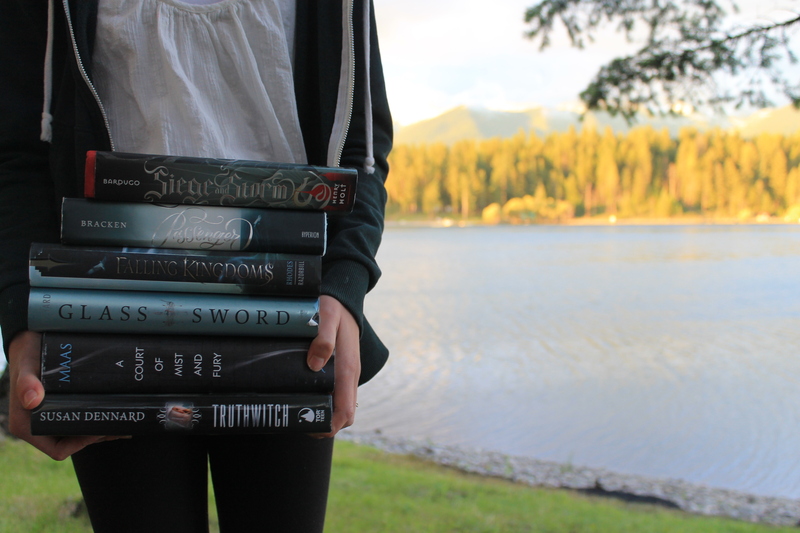 The characters were all amazing, especially the strong friendships they formed, and I really enjoyed the plot/story. And the writing was so beautiful! It was hard for me to get into it at first though. I would definitely recommend this book to just about anybody. Yes, you do! it was such a wonderful story. I read this book last year and really liked it! I’m glad you did, too. I wish more people read Stacey Lee’s books! This was my first book of hers, but I’m definitely looking forward to reading more soon!